Ceiling & Cabinet Fans | S&P Canada Ventilation Products, Inc. The extremely quiet FF and FFC ventilators are available from 100 to 3600 CFM, with static pressure capability up to 1". All units have centrifugal blower wheels and low RPM motors on resilient mounts. 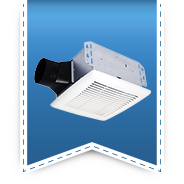 These ventilators are used to exhaust air from a variety of commercial and institutional applications, such as restrooms, conference rooms, offices, storage areas, restaurants, retail stores, schools, and similar buildings to acquire a quiet atmosphere with your high-capacity ventilation needs.